to act as a feeder group for membership of the senior Russian Fascist Party. The ideology and tactics of the Union were entirely determined by members of the Russian Fascist Party. 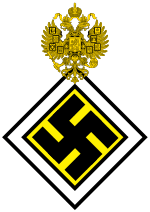 Membership was obtained on recommendation of an existing member of the Vanguard, or a member of the senior Russian Fascist Party.